The most desired boy-next-door – Shahid Kapoor is one of Bollywood’s most multidimensional actors. Having mesmerized us with characters in Jab We Met, Kaminey, Haider and so many others, Shahid has the right combination of dynamism and charm. Shedding his chocolate boy image and slipping into critically acclaimed alpha-male characters, he has always been the perfect mix of mush and mettle. One of the many constants in Shahid’s career has been fitness. He has worked hard to maintain his physique and his chiseled body and washboard abs have constantly been a source of inspiration for men and women. His fitness levels speak of consistency. From a lean, sculpted frame, Shahid has worked hard to achieve his brawny look over the years. A self-proclaimed fitness freak, he believes in exposing his body to a range of different physical activities to achieve better results. Here’s a sneak peek at the kind of workouts and diet he follows. A trained dancer, Shahid hits the gym 6 days in a week and follows a very rigorous workout regime. From body-weight training to cardio workouts and boot camp training, he does it all. Along with his intense workouts, he also focuses on his diet. When it comes to his fitness, Shahid has divided his workouts in such a way that he focuses on one body part a day. 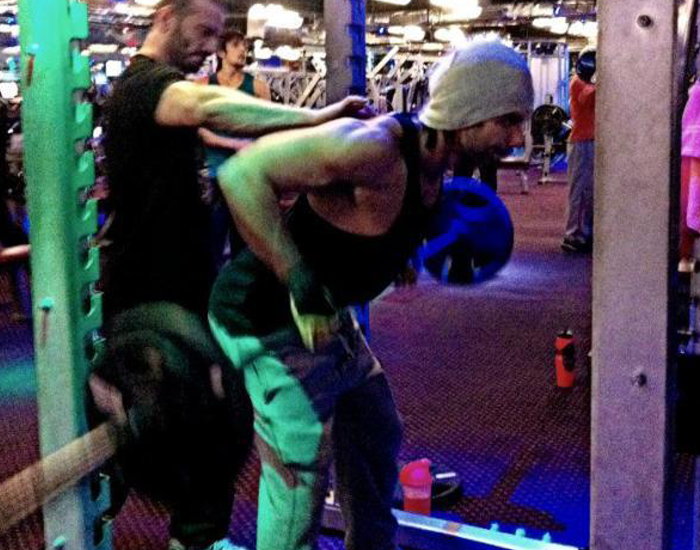 No matter how busy his schedule is, Shahid works out for 2 hours every day. Monday, Wednesday, and Friday’s –are for back, chest and shoulder and Tuesday, Thursday, and Saturday’s are for legs. He also undergoes boot camp regimes for his toned physique. For him, workouts consist of functional and CrossFit training. He is also a believer in building and having a good stamina and endurance. He never misses the opportunity to work out at the gym – even if he is traveling or home he makes sure to work out by himself. Apart from the gym, he likes to swim, run, and practices yoga daily. He enjoys running on the treadmill for 15 minutes every day. Shahid also emphasis on having a good sleeping pattern as it helps our muscles grow while we sleep. A strict vegetarian, Shahid enjoys green vegetables, fruits, and beans to provide him sufficient energy for his day. Instead of having big meals he prefers 5-6 small meals in a day and makes sure he has his meals at the right time. Pre-workout and post-workout meals are also necessary for him. Some may also think that he might not be able to get the right amount of protein in his diet since he is a vegetarian. But for Shahid, it is not even the slightest obstacle as he derives nutrients from other sources. Therefore, his diet is a mix of low-fat tofu, paneer, soy, brown rice, quinoa, fresh fruits, and green vegetables along with foods rich in amino acids. 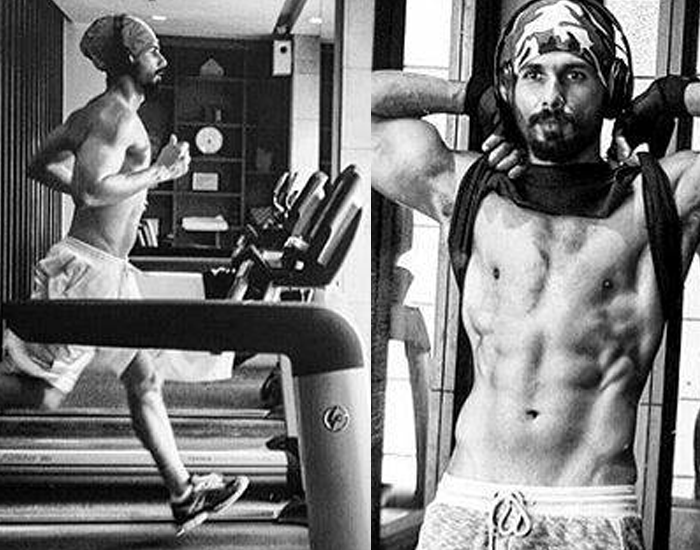 To portray Maharaja Rawal Ratan Singh in Padmavati, Shahid underwent a strict workout and diet regime. He went off sugar and salt for 15 days and survived on 50gms of brown rice and steamed vegetables for the entire day. He consumed meals like sweet nuggets made of coconut milk and a bowl of mangoes. Broccoli, kale, and spinach with grains and legumes rich in proteins were Shahid’s staple afternoon lunch. This helped him lose body fat and gain lean muscles. Shahid’s determination and dedication towards perfection is beyond impressive. A storehouse of energy, he sets the stage on fire and reaffirms that he is not going to tire down easily. 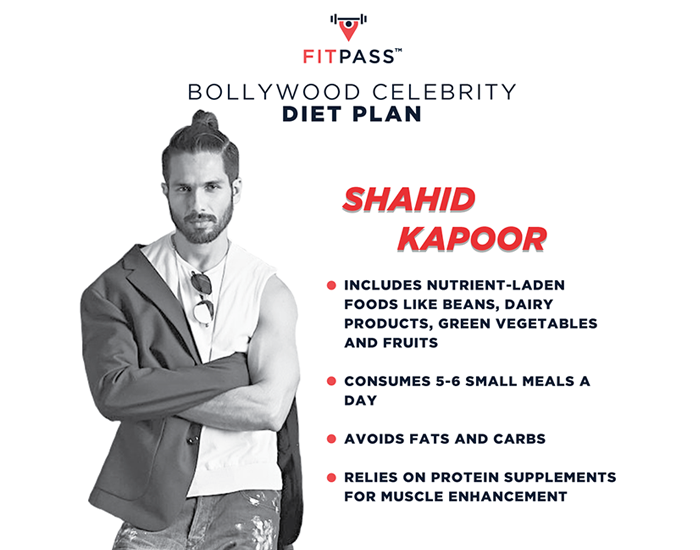 One of the few actors to peruse fitness as his passion, Shahid has played Bollywood’s most poised and powerful characters. Here’s wishing him more health and power on the release of Padmavati.